My husband has finally lost his mind! And I thought I was the crazy one in this household! This past weekend (9/13), we decided to spend a day (or two), at the Exotic Animal Auction which is held 4 times a year in Cookville (about 2 hours northwest from here). We got there a day late to buy any goats but we visited the “compound” and were able to see all of the upcoming available animals. Here we met Boris for the first time! Scott was taken by this huge but gentle animal. 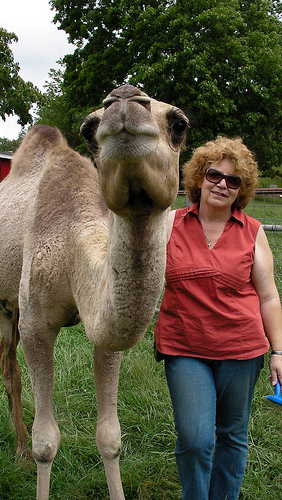 We “camel-talked” with the current owners and found out more about this gentle giant. Both mom & daughter were heartbroken at the thought of selling him but it was something they had to do. That night we came home and I did a bit of research on camels and learned that they are not that difficult to keep. We returned the next day and sat through hours of sales of miniature horses (we bought a pair – story to follow), and patiently waited for the camel sale. At this point we were interested in Boris (20 months old), and a two month old bottle baby. We won our bid on Boris and went “backstage” to get more info on him. Here we met an interesting fellow whom we plan to hire to help with Boris’ training. Boris got loaded up and made his way here to “Dreams Come True” farm. We absolutley love him! Scott can’t keep his eyes off of him and is like a dotting mom! The funny thing is to watch traffic as goes by. Everyone looks and then takes a second look with eyes & mouth wide open in disbelief! This will be quite the experience!